Dragon items are high-quality armors and weaponsDG made out of dragon parts. 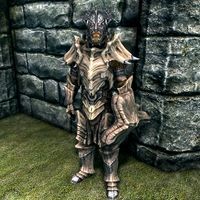 Dragon armors come in light Dragonscale Armor and heavy Dragonplate Armor varieties. Dragon weapons are added by the Dawnguard add-on, and require that it be installed. Dragon items can be crafted if the player has the Dragon Armor perk, the final perk in Smithing's perk tree. Unlocking it requires a Smithing skill of 100 and all of the perks in either the light armor or heavy armor branches of the perk tree. Note that unlocking this perk does not allow you to then travel down the other armor branch, e.g., if you unlock Glass Smithing and then Dragon Armor, you cannot then unlock Daedric Smithing if you don't already have Ebony Smithing. The Dragon Armor perk also allows you to improve Dragon items twice as much. This perk applies to both unenchanted and enchanted items (generic or custom), as long as the Arcane Blacksmith perk has been unlocked. Dragonscale is the best light armor in the game. It appears in leveled lists starting at level 46 (enchanted varieties at level 47). However, even after level 46, Dragonscale armor is twenty times less likely to appear than other armor types. All items can be tempered using 1 sample of Dragon Scales, and having the Dragon Armor perk doubles the quality improvement. 1 Dragon Bone is needed to temper the cuirass and shield. 1 Dragon Scales is needed to temper the boots, gauntlets and helmet. Having the Dragon Armor perk doubles the quality improvement. 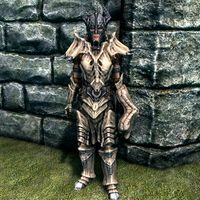 Although Dragonplate armor has a lower base armor rating than Daedric, the difference in base armor rating is not always significant. 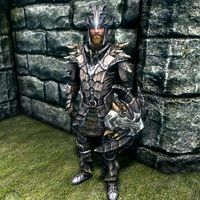 A full set of either type of armor can provide a character with an armor rating well past the 567 displayed armor rating needed to achieve the armor cap by applying the right combination of Heavy Armor perks, Fortify Heavy Armor enchantments while wearing the armor, and/or use of Fortify Smithing enchanted gear and potions while improving the armor. At that point, the lighter weight of Dragonplate (79 vs 96) may make it more attractive than Daedric (unless you have the Conditioning perk or The Steed Stone ability, both of which make equipped weight zero). Also, the materials used to make Dragonplate armor are generally available in larger quantities than Daedric Armor. Note that getting the Dragon Armor perk uses the same number of total Smithing perks as the Daedric Armor perk, if you take the left-hand branch of the Smithing tree. 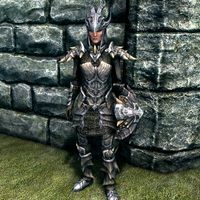 Another benefit of dragonplate armor is if you usually use light armor for yourself, focused on the left side of the Smithing Perk Tree, and want to make some powerful heavy armor for your followers, or do the reverse. If you are smithing Dragonplate Armor for profit, consider making Dragonplate Cuirasses, and then temper them with a Dragon Bone to increase the value. Dragonbone weapons are the highest-quality weapons available in the game, but are only available if the Dawnguard add-on has been installed. They do not appear in leveled lists, and can only be obtained via crafting or by looting a Keeper. All items except ammunition can be tempered using 1 Dragon Bone, and having the Dragon Armor Smithing perk doubles the quality improvement. This page was last modified on 23 October 2018, at 11:58.